It’s a common scene every time I stop by the local coffee shop for a mid-morning pick-me-up. The tables are full of people busily working their laptops, iPads and cell phones. (How does one, I wonder, get those types of jobs?) They’re definitely engaging in conversations, just not with the people immediately beside them. How did this happen? Coffee houses were once hotbeds of discussion and interaction. True third-places, they were the wellspring of insightful dialogue, like-minded networking, and political posturing. Today, this type of face-to-face interaction is being supplanted by online communities where like-minded people meet to exchange ideas. But new technology isn’t just changing the way we share ideas, it’s changing how we use our public spaces. As today’s coffee shops—and parks and plazas—go wireless, the nature of public space is changing dramatically. Are public spaces now, paradoxically, the places we go to ignore people? Keith N. Hampton, assistant professor, Annenberg School for Communication at the University of Pennsylvania, is studying how these technological changes are affecting public spaces. Just like with popular third places, popular online sites give people access to a more diverse network of people. 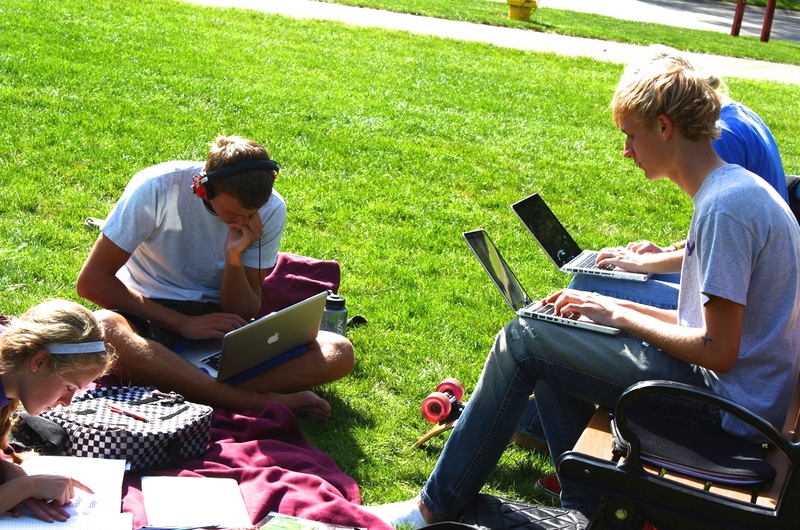 The question is, can online spaces ever be a substitute for actual physical spaces? Hampton offers a nifty social benefit conversion between “real” interactions and online interactions. 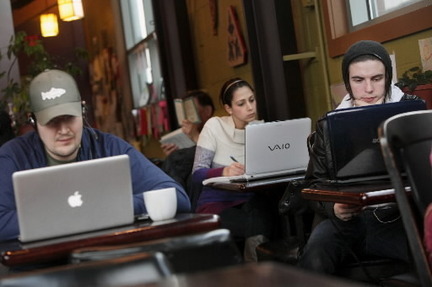 He found that internet use alone is about the equivalent of 7 coffee shop visits a month. Heavy internet use equals 2 church visits a month while online social networking equals 3 park visits a month. However, the social benefit increases significantly if you combine online interactions with public space. In fact, Hampton found that you get double benefit when they are combined. This is partly because people tend to spend more time in pleasant, public spaces—making it more likely that they will interact with the people around them. This can be a boon to parks, plazas, farmers markets, and other common spaces. Hampton found that 25% of the people in a typical public space would not have visited before WiFi was available and 70% said they came more often because of WiFi access. The average laptop user makes 2, one hour visits to a public space per week if WiFi is an option. We talk a lot in our field about ways to draw more people to public spaces. Perhaps the answer is not to insist on returning to an age where debate and discussion was solely located in physical spaces, but to find new ways of layering public spaces with technology. Public WiFi is now much more achievable than even 5 years ago, and when I put together a free WiFi program in our downtown, the first two areas I wanted to go wireless were a park and a public plaza. Let’s face it, most of us won’t stop checking our email on our phones anytime soon so we might as well be doing it someplace pleasant.